A long-running row over a move to rename the South African capital, Pretoria, is a reminder of the popular significance attached to city names - and the sensitivities that can be stirred by trying to change them. 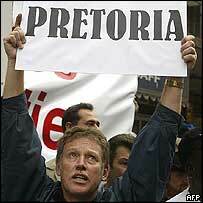 Pretoria was named after a settler and folk hero from the Afrikaner group, which went on to create the apartheid system. It is now expected to take the name Tshwane, after a black tribal leader who ruled long before white colonisation. The name also means "we are the same" in the Tswana language. Ironically, South Africa's last apartheid President FW de Klerk has argued that Pretoria remains a proud name because of its anti-colonial association - with the Dutch Boer struggle against British rule. But Pretoria's renaming is part of a national drive to make South African cities sound more African, which its proponents say fits with a continent-wide trend in the post-colonial era. They point to the renaming of the Zimbabwean capital Salisbury as Harare, and the rebirth of Mozambique's capital, originally named after Portuguese trader Lourenco Marques, as Maputo. The trend, of course, extends beyond post-colonial Africa. In some cases, cities are renamed to assert local pronunciation over foreign. The Burmese government has decreed the capital there should be known as Yangon - and not as Rangoon, as spelled by the British after they annexed the city in 1852. Are we Indians so insecure in our independence that we still need to prove to ourselves that we are free? The name of the Chinese capital has been rendered several ways over the years. During China's 1928-49 civil war, the Kuomintang party decided to call the city Beiping, or "Northern Peace", and not Beijing, the "Northern Capital", which it thought legitimised the city's then warlord government. That was reversed by the victorious Communist Party in 1949, but the use of Beiping continued for years in Taiwan, seat of the ousted Nationalists. Meanwhile, other changes were afoot. For years, the city had been known as Peking - a spelling attributed variously to Jesuits in the court of the late Chinese Ming dynasty, British colonialists or French missionaries in the 19th Century. From the 1950s on, the "New China" decided to standardise the transliteration of Chinese characters according to the Pinyin system, based on the northern Mandarin dialect (used in the capital), and hence the spelling "Beijing" began to displace "Peking". Renaming cities has been one way in which India has sought to reclaim national identity since throwing off British colonial rule in 1947. 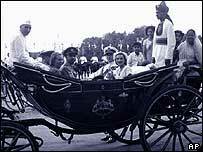 The British colonial capital, Calcutta, was renamed Kolkata in 1999, following the renaming of Bombay as Mumbai and Madras as Chennai in the mid-1990s. Popular lore has it that the names Bombay and Madras originate from the language of early Portuguese colonisers. Bombay's replacement, Mumbai, derives from Hindu goddess Mumbadevi, while Chennai is said to be a name of Tamil origin. But their renaming was not without controversy. Opinion polls at the time suggested local people were divided over the renaming. "The weather will be just as sultry in Chennai as it used to be in Madras. But are we Indians so insecure in our independence that we still need to prove to ourselves that we are free?" asked Indian writer and UN diplomat Shashi Tharoor in a newspaper column in 2002. Other commentators suggested it was a populist measure by local politicians. After a city name has been changed, it may take time for international as well as local usage to adapt. Official bodies and media organisations often wait for a new name to establish legitimacy before they begin using it themselves. The renaming of cities can also reflect their boom or decline. The Japanese port city of Edo (literally "Door to the Bay") was renamed Tokyo ("Eastern Capital") in 1868, when the city became the formal capital. The renaming marked the end of the rule of shoguns in Japan, and the formal restoration of power to the emperor. But it also marked the modernisation of Japan - a modernisation which had been set in train in 1854 when US Commodore Matthew Perry forced open Japanese ports, ending more than two centuries of Japanese isolation. Edo had long been the de facto commercial capital of Japan - a bustling, rough, working city. Its recognition as such was symbolic of Japan's embrace of commerce and trade which was to see it emerge as a world power within decades. Sometimes cities can even mark changing civilisations. 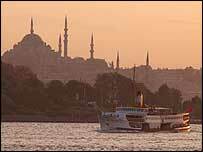 The Turkish city now known as Istanbul has been through many reincarnations. It was founded as the Greek city of Byzantium, becoming Constantinople under the Romans, and then conquered by the Ottomans to be reborn as Istanbul. The history of St Petersburg reflects political twists in Russia's past. It was founded in 1703 on the marshlands next to the river Neva on the order of Peter the Great, who wanted to match the splendour of European ports. He named it after his patron saint, Peter. But as the European powers went to war in 1914, the name was changed to Petrograd to sound less German. Ten years later, the city was renamed Leningrad in honour of the deceased leader of the Russian revolution. The city's inhabitants voted to revert to the name St Petersburg in a referendum in 1991, following the collapse of the Soviet Union - but there was significant dissent. Some argued that the name Leningrad should be retained in honour of the hundreds of thousands of residents who perished during the 29-month-long German siege of the city in World War II, during which an estimated 800,000 people are feared to have died. Yet other cities' names can reflect a cult of personality. In 1993, Turkmenistan's main port was renamed Turkmenbashi in honour of President Saparmyrat Niyazov. The name means "leader of all Turkmen", and is the title Mr Niyazov took when he went from being communist leader of Soviet Turkmenistan to the independent country's president for life. An oil refinery, airports, numerous towns, farms and even a meteorite which landed in the republic in 1998 have all been named after Mr Niyazov. Do you approve of city names being changed? Should Africa get rid of its remaining colonial names like Libreville, Brazzaville and St Louis? What would you call them? Interpretation of the landscape should reflect the values of a people. The changing of Pretoria to Tshwane is a positive move, and one that should strongly indicate the transformation of South Africa since the end of Apartheid. My home country, Ireland also went through this process, following the end of British occupation. Towns such as Queenstown and Kingstown were renamed Cobh and Dun Laoghaire respectively. It is symbolic and important to restore ownership to all people and not just one tribe, clan or ethnic group. Why do people get upset about the BBC or anyone else calling somewhere like Mubai, Bombay, but don't bat an eyelid when the same people and/or organisations refer to Muenchen as Munich or Koeln and Cologne? I refer to Bombay, Calcutta and Rangoon as long as the ignorant majority insist on using names like Nuremberg, Moscow, Rome, Florence, Turin and Munich - all incorrect! They can change all the names they want. But of all the name changes, Bombay is the least justified in my view. This name will live forever as there are many products and establishments around the world that bear this name and I am sure that they will not change it. The change of some names, especially in South Africa is right and proper because people are trying to reclaim that which is part of their heritage and one's cultural identity is priceless so I do not see why people feel that it is a waste of money. As a response to Emile's suggestion of Soweto having a name change, I don't think it is necessary to change this name because it is name that carries a lot of South African history for all even including the southern African region. Isn't the issue really about what the objective is in changing a city name, and where that objective is approved of by a democratic process in a democratic state, it should be done? I accept that in the less democratic countries (China for example) you wouldn't get that level of choice, but I believe that in Pretoria they have voted on it at city council level and agreed to do this on the basis of that vote. Presumably they have their reasons, and those have been justified adequately to the council. Arbitrary re-naming is just silly, but in this instance, it seems to have gone through due process and a number of reviews. I work with a number of Indian colleagues and they have adopted the new Mumbai and Chennai names eagerly; I should imagine that in a couple of years Africans will feel as confident about Tshwane. The name of a city should reflect the history, politics and language of the place. Calcutta to Kolkata and Bombay to Mumbai are appropriate changes for those reasons. If people of a city feel that they do not wish to refer to their domain with a name given by former colonial rulers then that is well within their right (even if the weather is still sultry!). Yes, there is a moral duty on the politicians who are in charge of democratic governments to ensure that the wrongs of the past are reversed. Whilst people can forgive, it is very difficult to forget, therefore place names that bring back sad memories should be changed. It is arrogance and/or ignorance that can make one defend the retention of such names which is insensitive to the people whose lives were destroyed by the so called heroes. I was surprised your correspondent failed to mention reverting to pre-colonial names closer to the home of many of your readers - Wales. A massive non-violent direct action campaign in the 1970s by the Welsh Language Society changed the iniquity of having Welsh places having their names misspelt in an English way or given English names. The fight to change Pretoria to Tshwane is the same struggle to revert the name of my county from Cardiganshire to its indigenous 1500 year old, Ceredigion and Anglesey to Ynys Mon. It's a world-wide anti-colonial campaign. I think that renaming places just creates confusion and inconvenience. It is just a populist measure adopted by politicians who should be concentrating on more important issues. Changing the names of towns is often a way to divert attention from unsavoury facts - the government has not lived up to its promises dating back to 1994. Changing the names of towns won't change this or make things any better. Official names of cities should be the same as the names used by the common masses living in the city. For example, the people of Calcutta always called the city Kolkata. For 200 years, only the elite - perhaps the wealthiest but also the most articulate and powerful 1-2% - called it Calcutta. If the ordinary people of London or Dundee called the cities by some other name, should we not be using that name for official purposes as well? This holds true for Mumbai as well and hence the change in names was justifiable. Pretoria is as part of colonialism as Rhodesia is. It must go and that's all there is to it! Though I was not very happy about Bombay being renamed to Mumbai, I found it a bit overboard when my friend went into depression for days after reading the news in the papers. He originally came from Bombay and loved the city very much. He felt that there was a certain charm attached to the name Bombay. I do not mind names of cities being changed, so long as they are not done for politically motivated reasons. But most of the time, people demanding such changes are fanatics whose real intention has nothing to do with the love for the city. Their appetite for constant attention is never satisfied, as they keep moving from one populist issue to another. I remember losing a trivia quiz show on television several years ago because the host refused to accept my answer of Bombay, after it had been renamed and he said that the correct answer was Mumbai (although the question was entirely unrelated to the renaming, of course). I just could not forgive the government for it! In general, I think in terms of practical matters it may not be the easiest thing to do, and probably quite a waste of money, especially if it is done purely for nationalistic reasons or for political mileage. But I guess if it does give way to a feeling of cultural pride and belonging (whatever that means) without hurting much sentiment, I wouldn't think it's too big a deal. Back in the early 90s, after the socialist regime had to give in there was a very enthusiastic re-naming wave in Hungary. If there was a lesson to be drawn is this: if you are not able to live with your past you can say good-bye to your present and to your future. Identity has nothing to do with popular sensitivity, since the latter is just a temporary hysteria. Yes, I do approve. Initially, I thought the name changes in India were fairly ridiculous and a waste of money. Having thought about it more, I think that for a country with an ancient history such as India, it is important to assert its own identity after the two centuries of British Imperialism. This has nothing to do with insecurity (as suggested by S Tharoor) but everything to do with identity. Why should our major cities bear the names given by a foreign Empire? It's really that simple. Renaming of cities is a part of history. During colonial era most cities were named to match the tongue flexing capabilities of the settlers. If renaming these cities to the original names is the wish of the inhabitants then the rest of the world ought to respect their decision. I have lived both in Calcutta and Bombay and I strongly feel that these cites need more than a changed name. A better infrastructure is what is required. Moreover a name should not be changed, there is nothing to be ashamed of the past even if signifies a foreign rule, it is a part of our heritage and a foreign name should remind us of our follies. Renaming a city or road makes no sense at all. I think cities' names could only change if the majority of their populations "really" want that change. Otherwise, I think it's just pure demagogy and/or lack of something better to do from the part of the governments. The money spent in changing Pretoria's name could be used for much better purposes. I agree that there are many changes needed, but it should start with more important things, like providing food and shelter for the less privileged people in South Africa. I think its fine when the name change follows a clear evolution. Whether its St. Petersburg or Petrograd it still means "Peter's town" in honour of its founder. Likewise "London" is a derivation of the roman "Londinium", which reflects how our language has changed. Istanbul is allegedly a derivation of the the Greek "Istane poli" lit. "we go to the town" which reflects its Greek origins. Changing a name just for political point scoring is quite sad though and plays up to the worst sort of nationalist politics. Yes, I do believe that names should be changed to reflect the fact that there was and still is a culture and language that existed long before colonisation. Especially in cases where cities were named after their so called "discoverers" who imposed systems such apartheid. Local inhabitants should be free to call cities what they want, but there's no particular need for foreigners to change well-established usage. News agencies world-wide switched from Peking to Beijing to retain access to China. But the Italians don't get neurotic when foreigners refer to Florence instead of Firenze. Similarly, Bombay has been commonly used by English-speakers for that city for a long time - other than for contorted PC motives, we have no reason to change to Mumbai - indeed, I understand the change is not all that popular even among the residents of that city. Here in Switzerland, many towns have three official names and are referred to by other names outside of the country. It's not a big deal. Perhaps those who complain bitterly about these name changes should instead direct their energies towards returning their own cities' names to the originals. I'm certain your readers in Londinium, Eboracum, Lutetia, New Amsterdam, Technochtitlan, etc. would agree! I have no problem with the renaming of cities, and countries. It's just a shame that the BBC, and other broadcast and print media cannot just accept the changes. Even now BBC news refers to Myanmar as Burma, and Yangon as Rangoon. And you will even hear references to Bombay and Madras. We should owe the decisions of other countries in the naming of their cities with more respect in UK. I don't think those Indians in poverty will care if they are poor in Bombay or Mumbai. Changing place names is something politicians do when they have better things to do. True cultural and racial integration is achieved by tolerance and respect for diversity. Trying to erase every aspect of the white population from the map of Africa is doing nothing to increase cultural and racial integration rather it is about one ethnic group showing its dominance over another. I am not particular in favour or against the name change of Pretoria to Tshwane. However, why don't they rather change the name of Soweto to something more proudly African? Soweto is short for South Western Townships, a name given to it during colonial and apartheid days. A lot of history has taken place there. Surely it deserves a better name? It wastes a lot of money which could be used to feed, and house the poor. What are the rules for national flags?